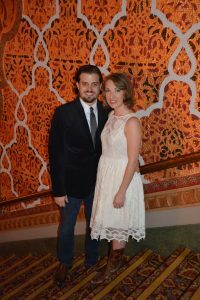 Ryan and Kristen McBee eloped in the balcony on an afternoon in 2015 and then celebrated that evening at the Jason Isbell concert. With Valentine’s Day around the corner, we wanted to know more about their love story. TT: Where did you two meet? KM: We met in a leadership development class in Atlanta while we were both working for GE (he in Knoxville, me in Atlanta). In the café during a lunch break one day, Ryan went on and on about the new University of Tennessee football coach, Derek Dooley. I couldn’t care less about it, but I was rapt. There was something about listening to him talk that made me want to listen forever, and I was bummed when lunch break was over. So we chatted again during lunch the next day. This time it was about NASCAR. I was going to my first NASCAR race the upcoming weekend with some friends, and I knew zilch about it. Ryan gave me a crash course (pun definitely intended) and made it seem a lot more interesting than I expected. As good millennials do, we chatted via the Internet for a while, moved to text, then eventually phone calls and months later an actual in-person date. We met halfway in Chattanooga for our first date, and we’ve taken the halfway approach as often as possible in our relationship. TT: When was the first time you came to the Tennessee Theatre together? KM: I don’t recall our first visit together, but there have been dozens in the 6 years I’ve lived here and we’re awed every time. 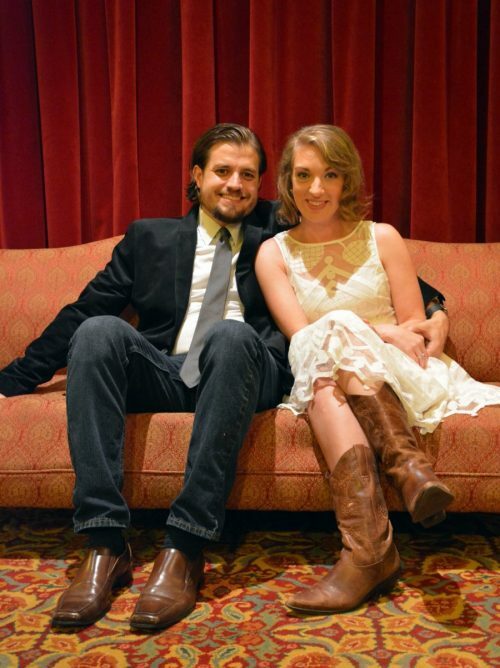 TT: What inspired you to be married at the Tennessee Theatre? KM: Have you seen it? It’s beautiful! We happen to call Becky Hancock, Executive Director of the Foundation, our friend so we asked if she would let us elope there and be our witness. We are so grateful she said yes! It’s a place we go often, a place we love, and a place where our love has grown. Couldn’t ask for anything better! 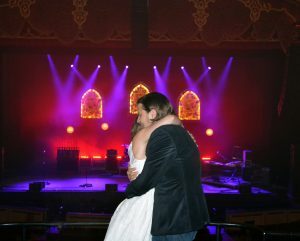 We chose the day of our first date, and it just so happened that Jason Isbell, one of our favorite musicians, was playing a concert at the Tennessee Theatre that night. We called the concert our wedding reception. TT: When was your wedding at the TT? KM: November 6, 2015 – the 5th anniversary of our first date! TT: What do you remember the most about that day? KM: I remember it all vividly, but I think the thing that stands out is the nervous excitement. We were eloping, so I didn’t anticipate being nervous and anxious, and we both were. Hearts racing, shortness of breath, the furtive glances – “are we really doing this?!”. Once the short ceremony began, we settled. Whew! RM: I remember it all: Nerves firing as we walked through the empty lobby. Excitement as we made our way to the balcony. The giddy excitement after the ceremony and the laughter as Becky took our pictures. TT: What is one story about your wedding that you share the most? 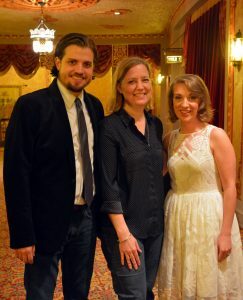 KM: Our little story, along with a photo of us from just after the ceremony, was shared on Tennessee Theatre’s social media pages. When we were walking into the concert that evening (Jason Isbell, whose light check of neon lights made to look like stained glass was the background in our photos), people on the other side of Gay Street yelled congratulations at us. We were still wearing our wedding getups, so were recognizable. We were a little famous in downtown Knoxville for the day! TT: Do you have plans to attend an event at the theatre in the coming months? If so, what event(s)? KM: Oh yes. We have Broadway series season tickets (every year! ), and we go to several concerts a year. In fact, Jason Isbell is coming again soon, and we have tickets to both nights! TT: Do you have a favorite memory from the theatre, aside from your wedding? KM: We’ve had so many it’s hard to choose a favorite. We thoroughly enjoyed the tour we took during which we learned the names of the chandeliers in the grand lobby (and whom they’re named after), learned how the reels worked upstairs, walked into the ceiling by the dome, and hunted for secrets painted into the walls. We also had a great time, along with Ryan’s mother and grandmother, watching a season premiere of Downton Abbey with a thousand other fans. And every year we attend the TVA Credit Union’s annual meeting. Also, Ryan would like a shout out to all the Widespread Panic shows over the years. TT: Anything else you’d like to share? RM: We just love the Tennessee Theatre and not only for the shows or its majesty, but also for the mission of the Tennessee Theatre Foundation. We love that the Theatre has become more than a place to see a concert or a show and has developed a mission to bring arts and entertainment to everyone in our community. In an era where we lock up our antiques for safe keeping or where entertainment venues cater to only the privileged, the Tennessee Theatre works to remain accessible to everyone. It’s a truly special place, with an amazing story, and we feel honored to have a small part in it.